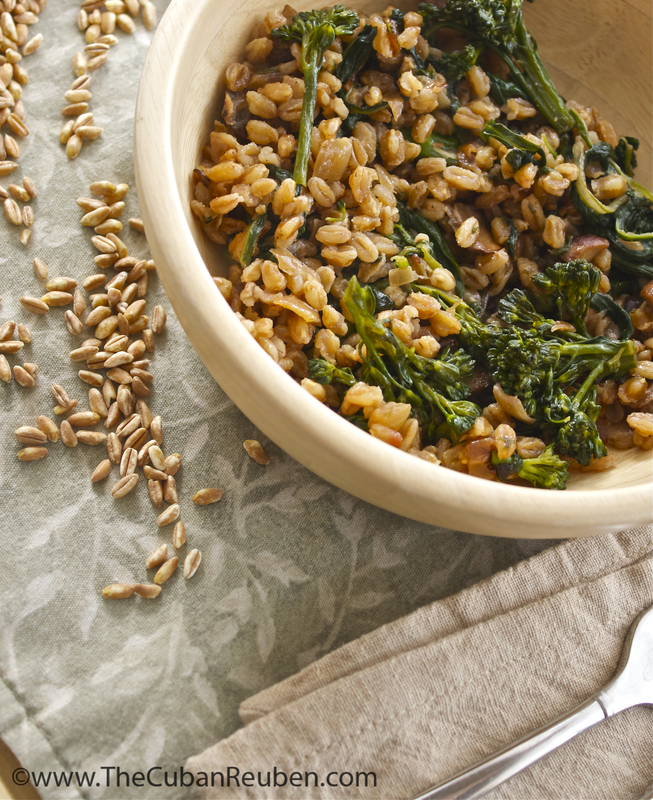 Farro: a love letter to my vegetarian friends. Every once in a while, I’ll throw together a dish using only ingredients I find in the pantry and fridge. And every once in a while, I hit a home run good enough that Kenny requests the dish time and again. I did it with my “Tilapia a la Jenny,” and not too long ago, I did it with farro. For those of you who aren’t familiar with this ancient Roman grain, allow me to introduce you, because farro is making a comeback in a major way. High in fiber and protein, its slightly nutty flavor and chewy texture make it a favorite amongst vegetarians and carnivores alike. 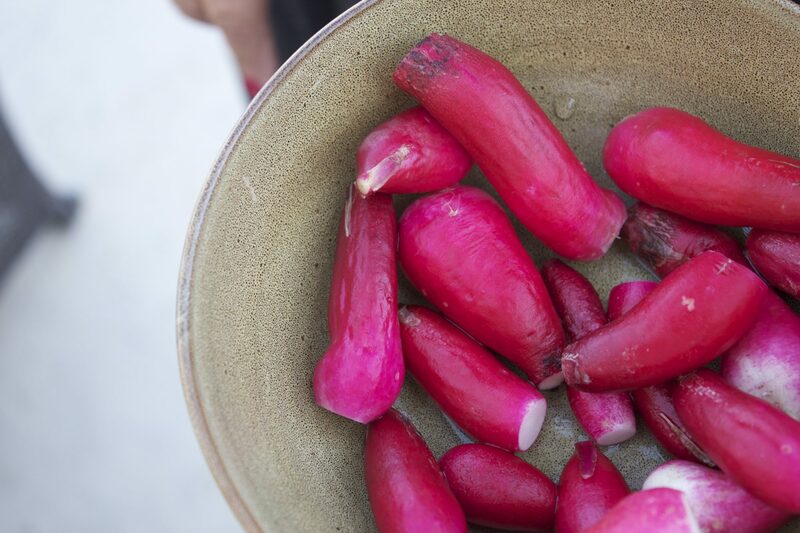 Best of all, its super cost-effective nature, meaning a little goes a long way, makes it ideal for feeding a crowd. Even though my “crowd” consisted of just the two of us, that bag of “10-minute” farro was calling my name from it’s hiding spot tucked away in the black hole known as my pantry. It was one of those nights that I came home from work exhausted, and hadn’t had time to run to the market. So, I did what I do best, and I foraged throughout my kitchen, pulling an onion from the basket on the counter, that pint of meaty crimini mushrooms that had been sitting in the fridge for a few days, and that bunch of broccolini I’d been meaning to use. Since I had never tasted farro before, I was a little apprehensive about its flavor, but then I remembered a rule of thumb my mom taught me ages ago. Whenever I cook grains whose directions suggest cooking them in water, I always add a boost of flavor by swapping the water with a corresponding stock. Often times, I use chicken stock, just because I always have it on hand, but vegetable or beef stocks are interchangeable in this particular recipe. Once I got the farro going in the stock, I made quick work chopping and sauteing the onions and mushrooms in a bit of olive oil. I added the broccolini at the very end, because I didn’t want it to lose all of its crunch. As soon as the farro was done cooking, I mixed in the vegetables, and topped it all with a nice snow of freshly grated parmesan cheese. As Kenny and I sat down for dinner, I was a little nervous to serve this to Mr. Meat-and-Potatoes, but my worries quickly subsided when I caught him serving himself a second helping. Lucky for me, he left enough leftovers for me to indulge with breakfast the next day. And oh, was I ever thankful. Topping this dish with a poached egg and watching the runny yolk drip over the farro might just be my new favorite way to start the day. This is how we do breakfast in my house. Consider this dish a love letter to vegetarians (but know that carnivores will love it, too). Cook farro according to package instructions, swapping the stock for the water. Meanwhile, in a large saute pan, heat olive oil, and swirl to coat the pan. Add the onion, garlic and mushrooms, and cook until the onions are transluscent. Add broccolini, and cook for 2 minutes. Season vegetables with kosher salt and freshly ground pepper, and add the cooked farro. Mix well, and top with freshly grated parmesan cheese. I can’t wait to try it. It sounds delicious.